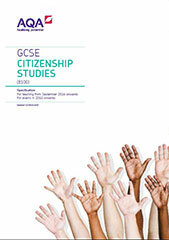 Why AQA GCSE Citizenship Studies? Students will gain a deeper knowledge of democracy, government and law. They'll learn how to create sustained and reasoned arguments, present their own viewpoints and those of others, and plan practical citizenship action that delivers benefits for society. They'll also gain the ability to recognise bias, critically evaluate argument, weigh evidence, and look for alternative interpretations and sources of evidence. Higher education and employers value all of these essential skills.